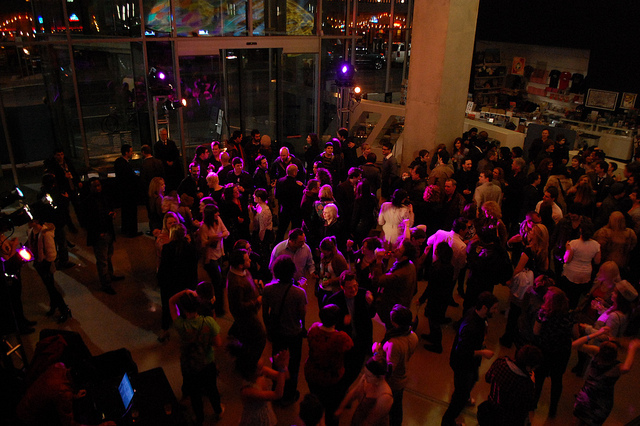 Opening nights have routinely become huge events at the Contemporary Arts Center (CAC) in downtown Cincinnati. The architectural masterpiece completed at the corner of 6th and Walnut Street allows visitors to enjoy cocktails, DJ entertainment and mingling on the ground-floor level, while enjoying the new and permanent exhibits on the upper levels. Each new major opening night celebration brings something unique, with the Shepherd Fairey party being one for the record books as thousands poured into the CAC and surrounding areas. On February 25 the CAC welcomed new exhibits by Keith Haring and Jimmy Baker, and the party was yet another big draw for the museum. One of the features of the opening night party was a video booth where party-goers were welcomed to enter and show off their dance moves. The end result is an entertaining and artistic. The video was edited by David DeWitt, and features “Hello” by Martin Solveig (ft. Dragonette). Enjoy.